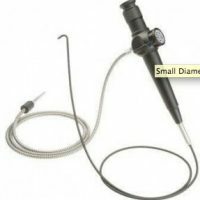 Flexible fiberscopes are great for one-handed operations so that your other hand can do the work. They come in sizes ranging from 0.5mm to 10mm and feature 2-way articulation. They are usually rugged with a stainless steel or tungsten insertion probe and water and oil resistant. They work great for automotive, aircraft, marine, locksmith, plumbing, and machine or casting inspections. 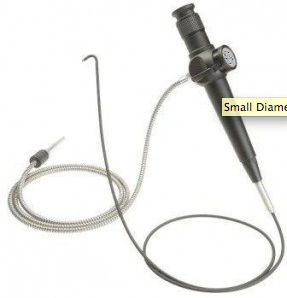 These scopes are also available with a light guide post on the scope handpiece instead of an integral light guide cable. Other light guide plug adapters are available including Olympus and Machida configurations. Fluid Resistance: Working length will withstand immersion in water, mineral and synthetic lubricating oils and hydraulic fluids, aviation fuel, kerosene, gasoline and diesel fuel.